Remograph, today announced the release of Remo 3D v2.8. Remo 3D is an OSG-based tool for creating and modifying 3D models intended for realtime visualization. The primary file format is OpenFlight®. Remo 3D is currently available for Microsoft® Windows® 10/8/7 and Linux. Remograph, today announced the release of Remo 3D v2.7. 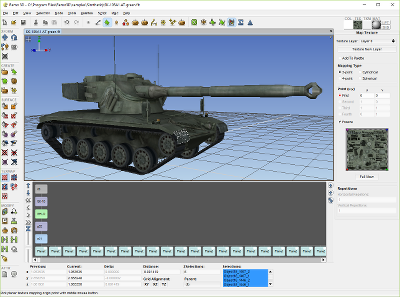 Remo 3D is an OSG-based tool for creating and modifying 3D models intended for realtime visualization. The primary file format is OpenFlight®. Remo 3D is currently available for Microsoft® Windows® 10/8/7 and Linux. Remograph today announced the release of Remo 3D v2.6. Remo 3D is an OSG-based effective tool for creating and modifying 3D models intended for realtime visualization. The primary file format is OpenFlight®. Remo 3D is currently available for Microsoft® Windows® 10/8/7 and Linux. Remograph today announced the release of Remo 3D v2.5. Remo 3D is an OpenSceneGraph-based effective tool for creating and modifying 3D models intended for realtime visualization. The primary file format is OpenFlight®. Remo 3D is currently available for Microsoft® Windows® 8/7 and Linux.